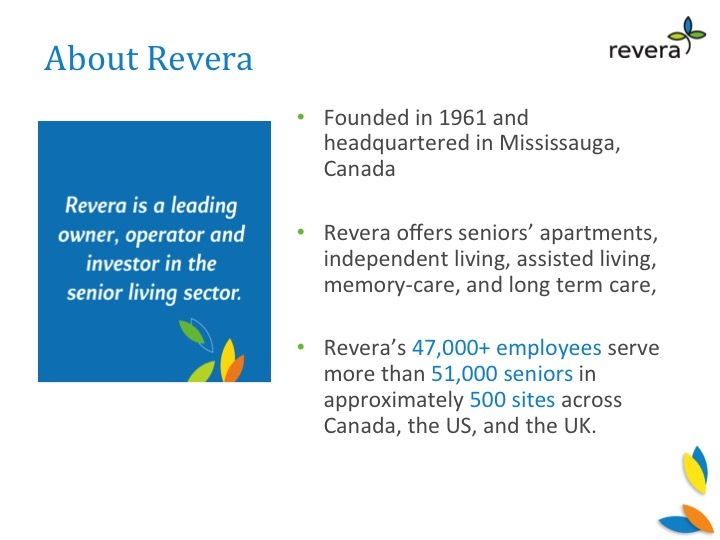 Barbato is Senior Vice President of Innovation and Strategic Partnerships for Revera Living, a provider of senior apartments, independent living, assisted living, memory-care and long-term care. Trish Barbato wants you to go beyond your comfort zone. In her current role, Barbato provides strategic leadership in the area of innovation, one of the company’s core strategic priorities. She encourages Revera's communities to consider how to bring innovation into their communities, even if it means reconsidering what feels comfortable and being willing to make some mistakes. “We can’t get too comfortable in what we’re doing and how we’re doing it. We need to be aware and open to change,” says Barbato. At the 2015 Senior Living Innovation Forum, Barbato described why her company, which services more than 51,000 seniors in approximately 500 sites across Canada, the U.S. and the U.K., created her position. If there is no one accountable in your organization for thinking about innovation, she said, that means no one is thinking about it. This strategy underscores how Revera leverages key partnerships, invests in future innovations, and tests new technologies to deliver state-of-the-art care to its residents. They do all of these things with the direct input of their key stakeholders -- their staff, residents, and their residents’ family members. “We asked the residents about their priorities, and they talked about things involving their personal dignity and independence. This was important for us to know,” she said. Revera’s current pilot cycle includes an innovative incontinence sensor, put outside a brief, that alerts staff when the resident needs their assistance. This maintains dignity for residents by eliminating unnecessary brief checks, especially during the night. The company is also piloting PARO, a robotic baby seal from Japan that has artificial intelligence. It is particularly supportive for residents with dementia. The seal responds to touch and its name being called. Family members listed communication between themselves, the staff and their loved ones as being top of mind, so Revera is piloting a new app to allow for more seamless dialogue between families and the community. You have to prioritize, and do so according to the wish lists of those main stakeholders, plus your industry partners, capital partners, academia and innovation experts, and come up with strategies. “We implement innovation pilot programs in those of our sites that have proven to be the highest performing,” she said. “This might seem counterintuitive,” she admitted. But this strategy has enabled her team to begin the initiatives earlier, since those locations had already proven ready for them. The other benefit: The incentive to become such a pilot site fostered improvements and drove performance in Revera’s other locations. Barbato encourages senior living providers to create a scorecard for measuring value against cost when it comes to evaluating any new products and services. These decisions should be documented, so you can demonstrate why you chose to go down a certain path, and so you don’t waste too much time going down the wrong one. 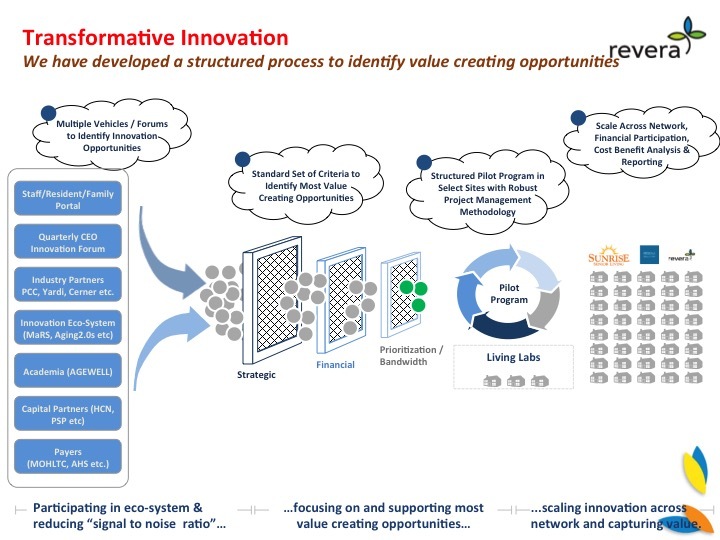 When a new product in its pilot phase works, delivering value and results to an extent that justifies the cost, the new program or product is deemed scalable and is rolled out to the other communities. When certain pilot programs go array, Barbato and her team probe why. In one instance, the pilot product being tested was a belt that residents wore with a sensor embedded in them that alerted staff to the resident’s need to be turned (to avoid bed sores). The belt proved to be quite uncomfortable, so the residents didn’t want to use them, and the staff did not want to force them to do so. This meant the belts would lie idle, but not off -- since the staff did not know how to turn the alerts off -- and false alerts were sent out, creating confusion. “We didn’t have enough feedback in real time to know this was happening such that we could have gone back at an early stage to the entrepreneur who designed it and either request changes to the prototype or stop using it, before wasting more time,” Barbato said. This notion of learning from mistakes and striving to improve brings us back to the theme of the human impetus to innovate that Barbato mentions at the beginning of her discussion. It is not the strongest of the species that survives, nor the most intelligent, but the ones most responsive to change.